I would like to believe that current buildings models are not the final decision and developers will make them more correct. Because it's very strange to see Romans, Mauryans and Ptolemies fortress without any gates. Also Romans barracks have strange model too, when isolated room have no doors or hatches but have windows. 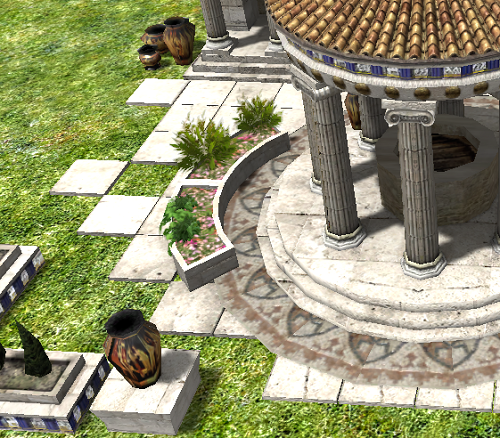 And finally, fix the missing tiles at Athenians, Spartans and Macedonians civil center. 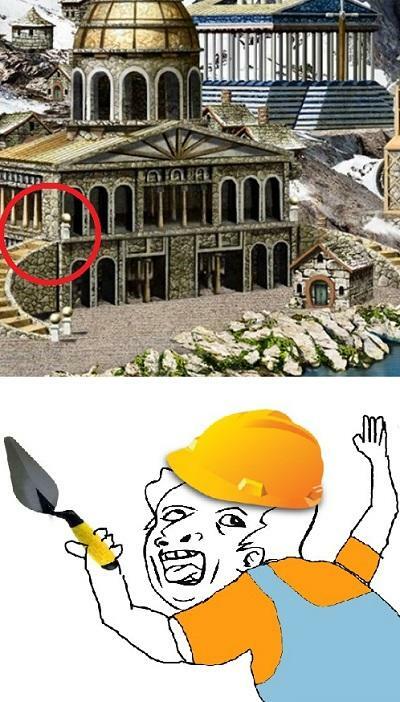 It`s very odd to live in brand new ruins. 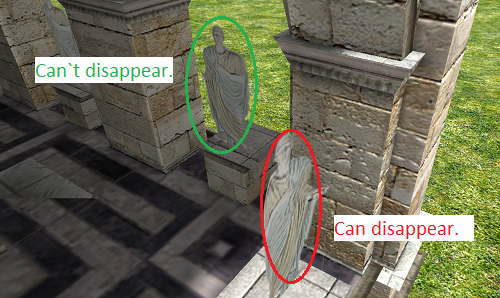 Also textures of statues at Roman civil center are disappear when you look from the side. 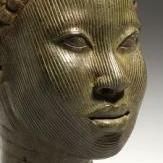 @LordGood @wowgetoffyourcellphone @Alexandermb @Sundiata @Lion.Kanzen Thoughs, references ? For my part I'm not against some fixes. But I'd like it to be backed up. Missing tiles are for terrain integration, but the lack of doors on defensive buildings I'll definitely give you, that needs fixing. Roman walls and barracks need to be replaced too, they have a reverse taper on their turrets and that's just a no-no by our standards plain and simple. Is in your hands, we need it purely accurate source? I think all structures of all civs should have ground decals, as it really helps a lot with terrain integration. Structures without ground decals look a lot less rooted to the ground/unnatural. need it purely accurate source? We just need non-absurd models. @Sundiata The way to fix that would be to have different sized ground decals for different civs, depending on where predominant construction sits on the urban/rural scale. Each friendly to its own structural texture pack. 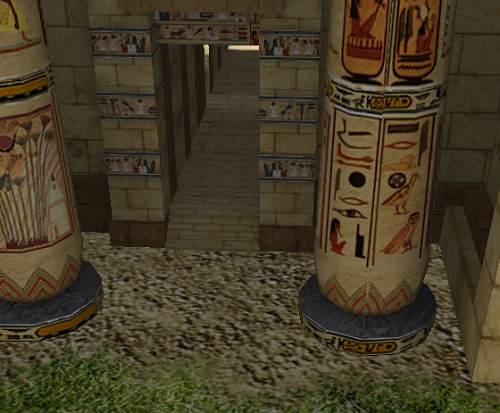 In regards to the ones missing them, i believe they work better in their native environments without them (mainly desert ones) This could solely be a result of not having civ-specific decals. The buildings need some scales in this kind of RTS. they can be 100 size but(an example) it would be uncomfortable to play. others are little mistakes. When I'm done with my commission series I'll see if I can't get try a prototype. 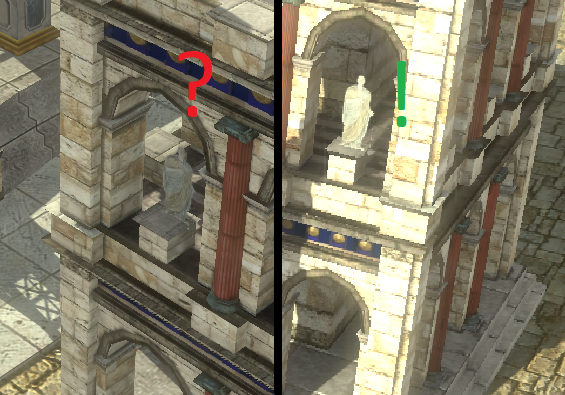 @RukoFiber Those statues are two dimensional, a concession to keep the poly count from skyrocketing. We don't have LoD rendering so we cut corners where we can. We don`t mentioned about endless arrows or hunger mode like it was at Cossacs 3 as we also don`t need huge building scales. I guess the simple textures fixes will not break the game. I also hope that developers will make some hatches or doors for wall-towers at certain nations. BTW, it will be great if they will teach AI to use wooden and stone walls with wooden watchtowers, which AI usualy never build. 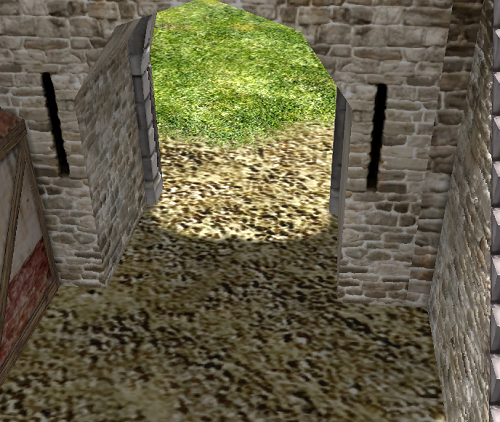 For example, AoE2 (not HD) AI use some algorithm to designate a path of future wall and willingly repair it after enemy siedge. The wooden wall can be used at early game or when AI have no stone etc. 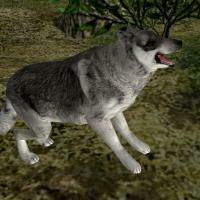 @feneurCan we get Ruko here the forum permissions to post more than 3 times? Adding hatches and doors everywhere is not really necessary but sure knock yourselves out. 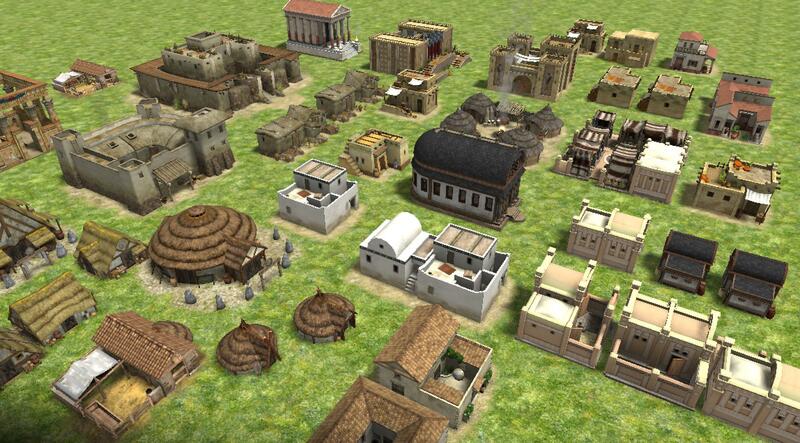 The biggest and probably most pertinent thing mentioned though is the design of the Roman barracks. It's a lot bigger than other barracks for some reason and retains the old pre alpha layout. I like the back 2 story section but the front half could use redesigned. 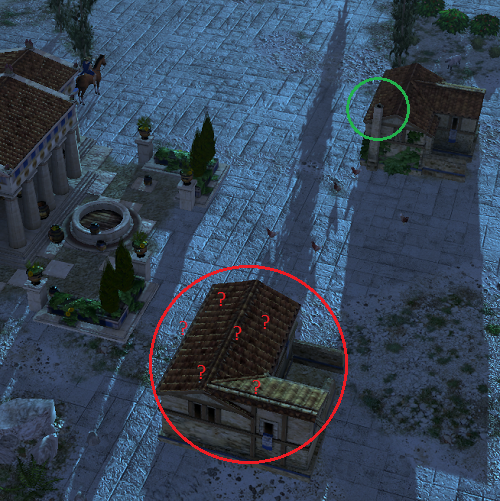 The Greek CC tiles could use filled in a bit and leave a few missing ones along the edge. I'm not asking to do World of Hatches. It`s only for better visual pleasure because it`s not text-based RTS. 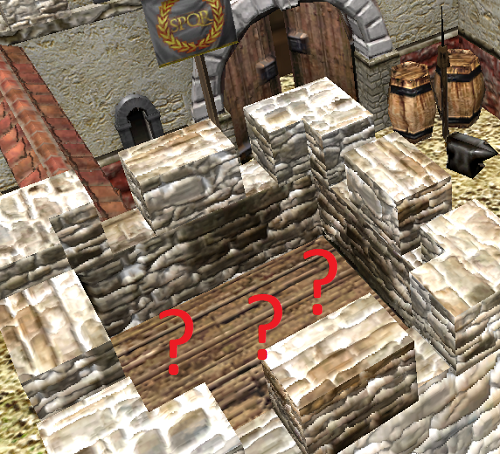 We don't have LoD rendering so we cut corners where we can. Well, I hope someday game will be able to save all textures at any sides of visibility. 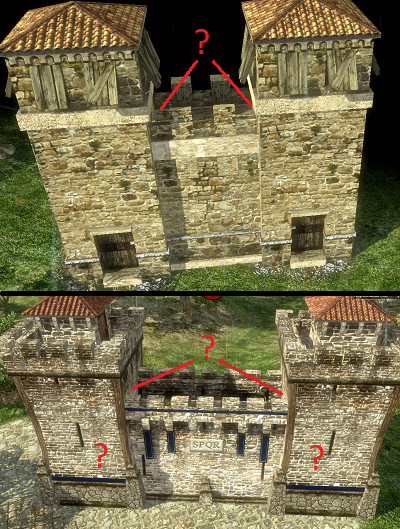 Some things like doors on walls are just not feasable, and workarounds would make towerless walls impossible for mapmakers. 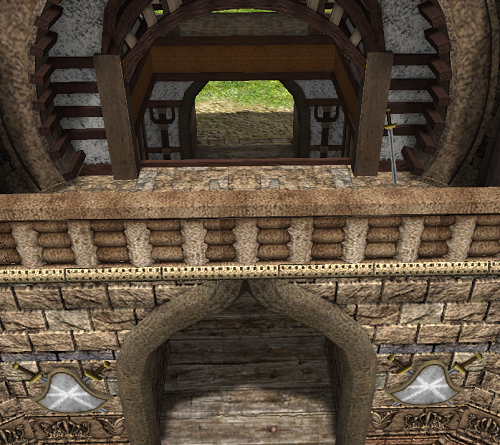 Doors are excluded on most wall turrets because though dependent on drag direction (clockwise correct) many times walls (and their turrets) will be facing the wrong direction. I forgot to ask! As I remember this game include night maps. 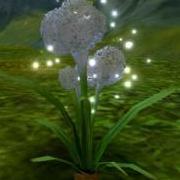 So, is it possible to make some night lights at buildings, torches etc. And what about chimneys? I think it must be at every conditionally residential house for more realism, especially at snow maps (fuming chimneys like Britons fortress). But unfortunately I didn`t know were the ancients use home oven or it was not necessary. And it will be great if game will use changing of night and day (activate night lights), changing weather (to cloudy will activate night lights, cold weather will activate chimneys smoke animation), changing seasons (cold will activate chimneys smoke animation, starting of season water floods, drought, sandstorms etc.) like it was at Age of Mythology and maybe Rise of Legends. And the most interested could be terramorphing like at some old RTS, when you can destroy or build bridges, grow bushes like you grow animals for food, grow forest for wood or searching new subterranean ore and mines etc. Should be too hard to paint for you once we have this map we can either make a normal map or use it as the alpha channel on said normal map to turn it into a parallax map. Gauls did not build them. woo lad you're grabbin for that mile lol. Chimneys should be doable where necessary and accurate. I dont think we'll have time of day map tags for a while yet even if the multiple lighting thing gets committed. Night/Day cycles never really made sense, since game time actually represents years and years of settlement growth. So, then the day/night cycle would rotate every 2 seconds. But it is a game after all, so concessions can be made in the name of coolness. Season changes make way more sense, and with them can come different lighting conditions definitely (and flooding on Nile and Tropic maps would be cool). But again, as you mention, it takes a programmer to come along who's interested in implementing that kind of stuff. I'm about to make a thread regarding my sound effect ideas, but I know, again, that it needs an inspired programmer to make it happen. Crazier things have happened. Having the sun rotate around the map at the speed of 1 full rotation every hour or half hour would be pretty sweet, dynamically changing angles, having a low point, and a high point, representing "summer" and "winter". Gathering a team means more people to complain about things and second guess (and third guess) every gameplay decision. And then people end up hating you and then you burn out hard after @#&#036;%king up a fundraiser. Perhaps I am being oddly specific.